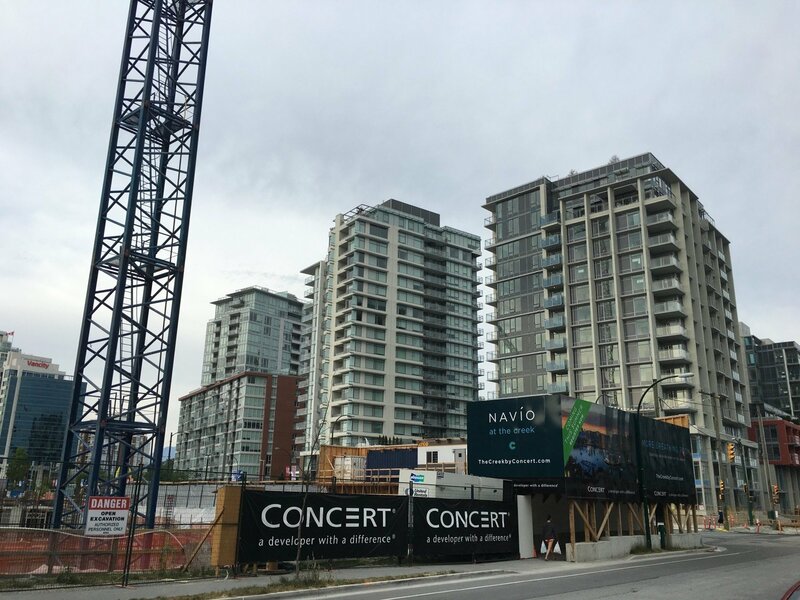 Concert is preparing to start presales for phase two of their popular “The Creek” development with the launch of Navío at The Creek. 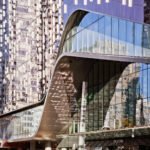 The building is actually the third to be constructed in the development, which sits between Quebec Street and the former Olympic Village, south of Science World. 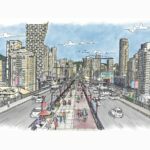 Once the development is complete, the now-empty surface parking lot will be transformed, with a new park connecting the seawall to East 1st Avenue and several new buildings and lanes. 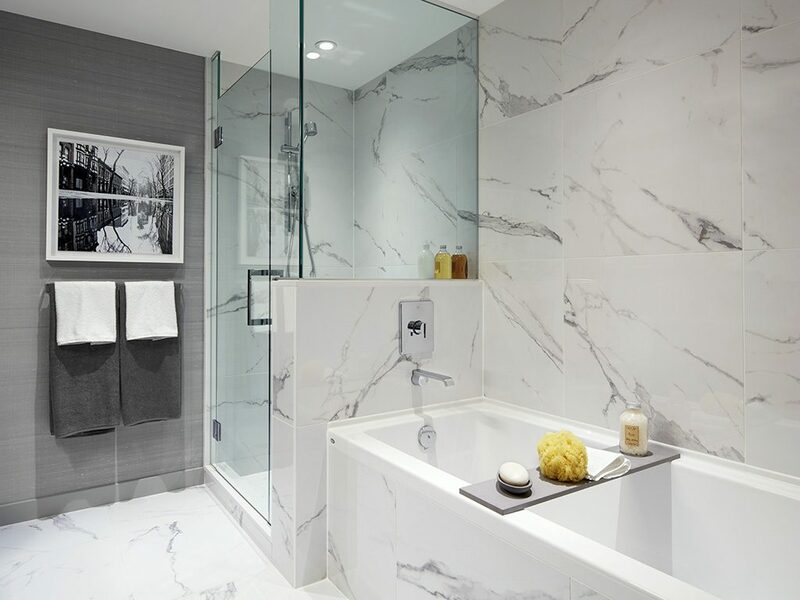 White marble bathroom with separate tub and shower at Navio by Concert. Bathroom at Navio by Concert. Kitchen with dark marble island at Navio by Concert. Kitchen at Navio by Concert in light colour scheme. 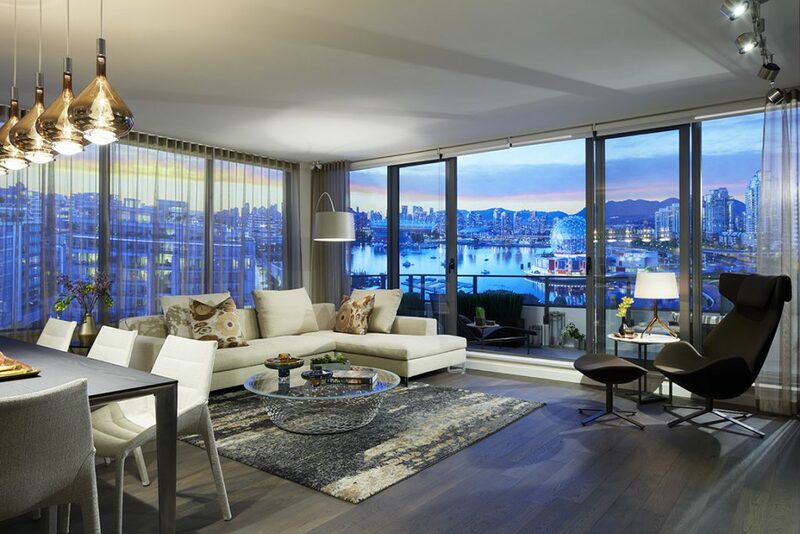 Living room of corner suite at Navio by Concert with a view to Science World and False Creek. 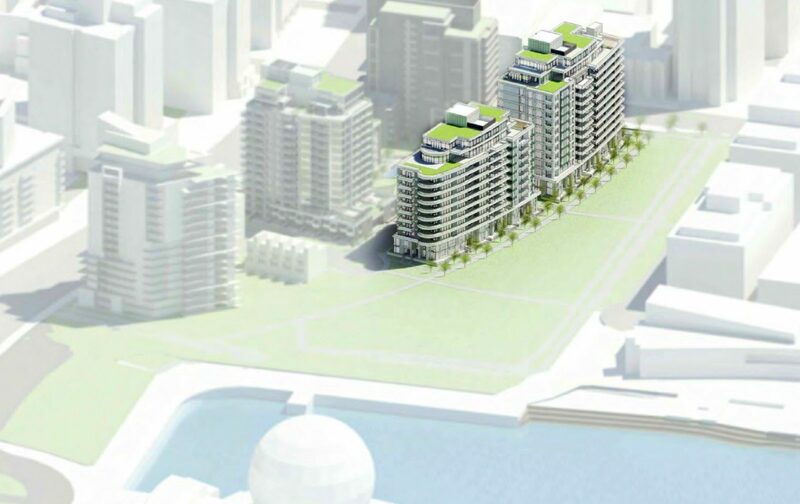 • NAVÍO comprises two boutique buildings – 12 and 14-storey. 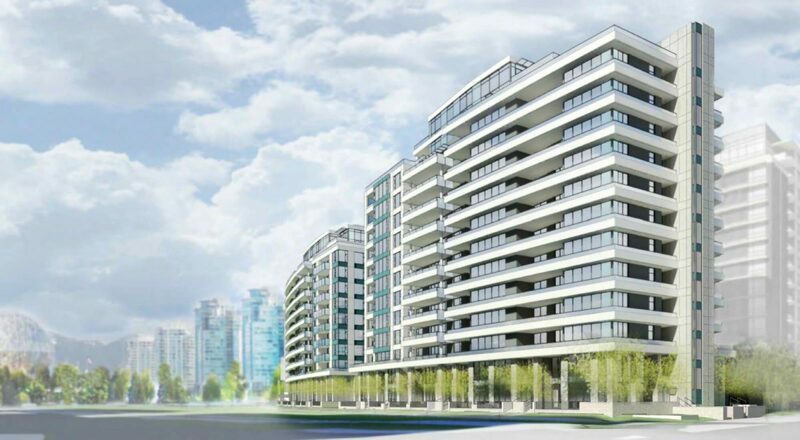 At the edge of False Creek on Vancouver’s celebrated Seawall, overlooking an expansive 2.7-acre park, NAVÍO is defined by superior design, quality and construction. • Architecture by Rafii Architects Inc. in collaboration with Richard Henry Architect Inc. • Interiors by BBA Design Consultants Inc.
• Energy-efficient, sustainable and liveable building design targeting LEED Gold certification. • Distinguished double-height lobby with concierge and adjoining lounge offers a stately sense of arrival. • Fully-equipped fitness room with cardio machines and weights, including indoor and outdoor space for stretching. • Two private rooftop Resident Lounges with entertainment rooms and kitchens opening to expansive landscaped terraces featuring seating and an urban rooftop garden. • Extensive bike parking plus Bike Hub for DIY tune-ups and maintenance. • Secured underground parkade complete with electric vehicle parking, on-site car-sharing and visitor parking. • Full-time, live-in resident caretaker. • Quarter-cut, solid-core wood veneer entry doors with Colombo Italian-made mortise lock set and elegant quartz entrance threshold. 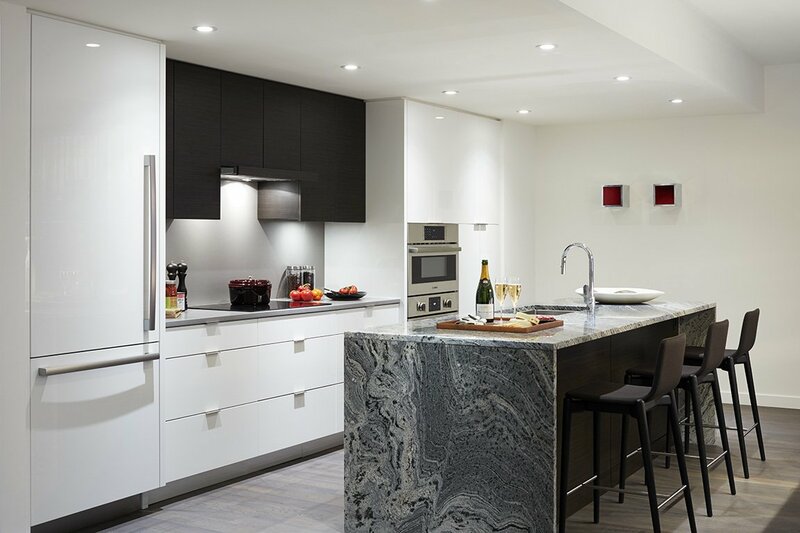 • Townhomes feature impressive two-storey stone façade entrance with gated patio, contemporary fiberglass door with frosted glass insets and Colombo Italian-made mortise lock set. • Wide-plank engineered hardwood flooring throughout living spaces. • Year-round comfort with in-suite controlled, energy-efficient air-conditioning, heating and ventilation system. • Contemporary custom roller blinds on all exterior windows. • Smooth-finish ceilings and flat-profile baseboards throughout. • Ceiling light fixtures included in all bedrooms. 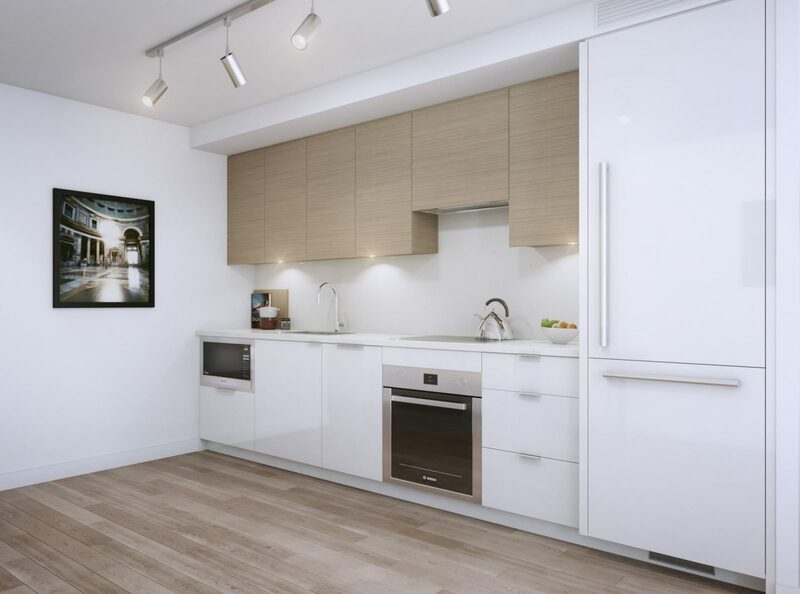 • Elegant wood veneer and contemporary highgloss white acrylic cabinetry. • Seamless quartz slab countertop and matching backsplash. • Single-basin undermount stainless steel sink and polished chrome pull-down faucet. • Built-in, touch-control electric cooktop in black ceramic and glass. • Integrated, low-profile slide-out Faber hood fan for a clean, contemporary look. • Polished chrome tab pulls and soft-close drawers. • Functional details include under-sink pull-out recycling compartments and recessed under-cabinet lighting. • Sophisticated wood veneer floating vanity with under lighting. • Custom wood veneer upper cabinet with mirrored door and wall sconce. • Seamless quartz slab countertops with undermount sink and polished chrome singlelever faucet. • Impressive, large-format 24” x 24” Sandstone or Carrera-patterned porcelain tiles – includes flooring, tub front and accent wall. • Matching Sandstone or Carrera-patterned porcelain mosaic tile shower flooring. • Solid-core, flat-panel doors for added privacy. • Registered for LEED certification and targeting LEED Gold accreditation. 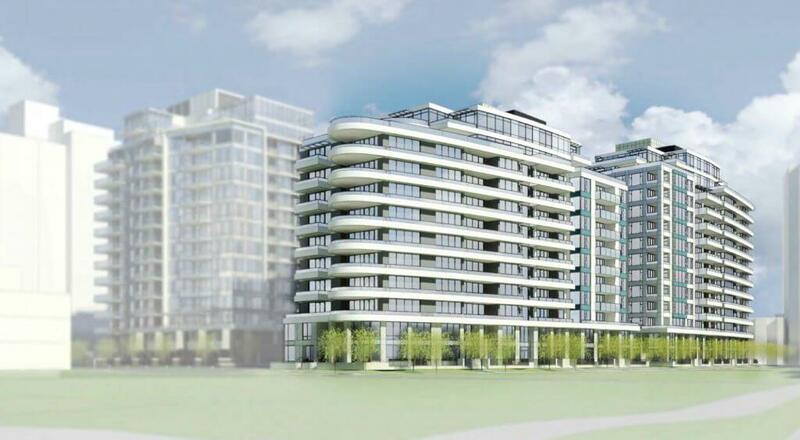 • Situated in a pedestrian and cyclist-friendly location with easy access to public transit and car-sharing networks. • Select parking stalls equipped with outlets for charging electric vehicles. • Connected to the Southeast False Creek Neighbourhood Energy Utility. • Extensive landscaping includes parks, courtyards, gardens and green roof systems. • Engineered with systems for capturing and managing storm water. • Smart sorting Recycling Lounge for easy on-site composting and recycling. • High-performance, double-glazed, low-e, argon-filled thermal windows. • Energy-efficient, motion-controlled lighting in common areas. • Low-VOC products used in suites and common areas. • Lobby concierge and full-time live-in resident caretaker. • Encrypted security key fob building access system. • In-suite TV monitored entry system. • Restricted floor access via two elevators. • Wired for advanced telecommunications requirements and instant accessibility. 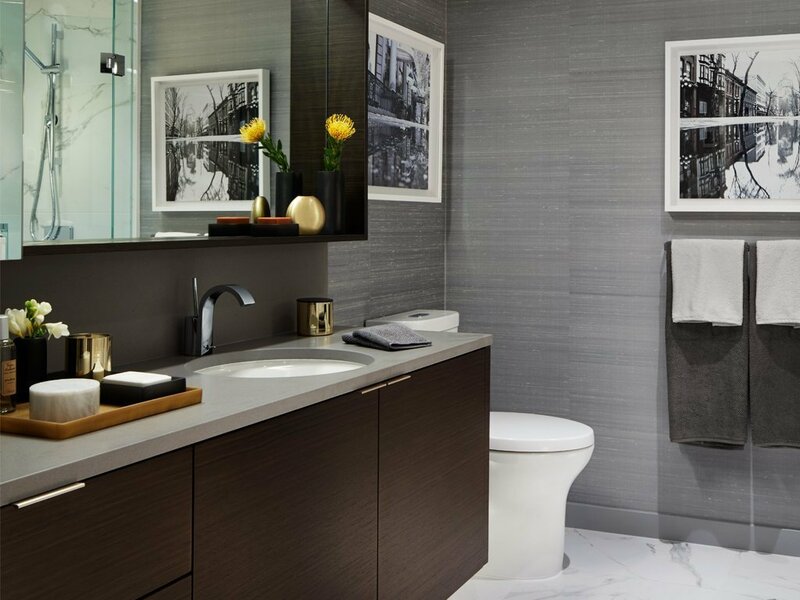 • State-of-the-art fire protection with centrally monitored in-suite sprinklers and smoke detectors. • Six-year water penetration coverage. • Two full years coverage on workmanship and materials. • Backed and matched by Travelers Guarantee, BC’s leading governmentapproved new-home warranty provider. *As per plan. Concert reserves the right to make modifications and changes to floor plans, project design, specifications and features. Final suite size, dimensions, and floorplans are approximate and may vary. 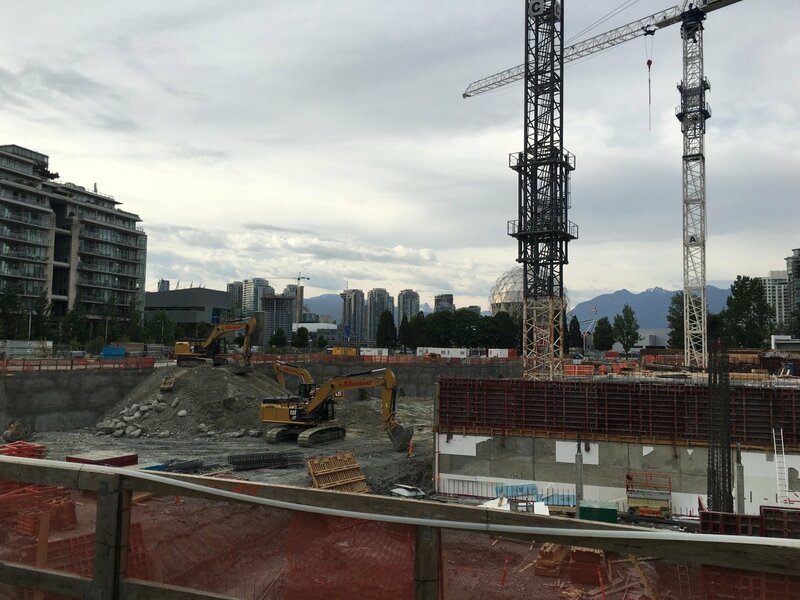 Construction site for The Creek by Concert, May 2016. 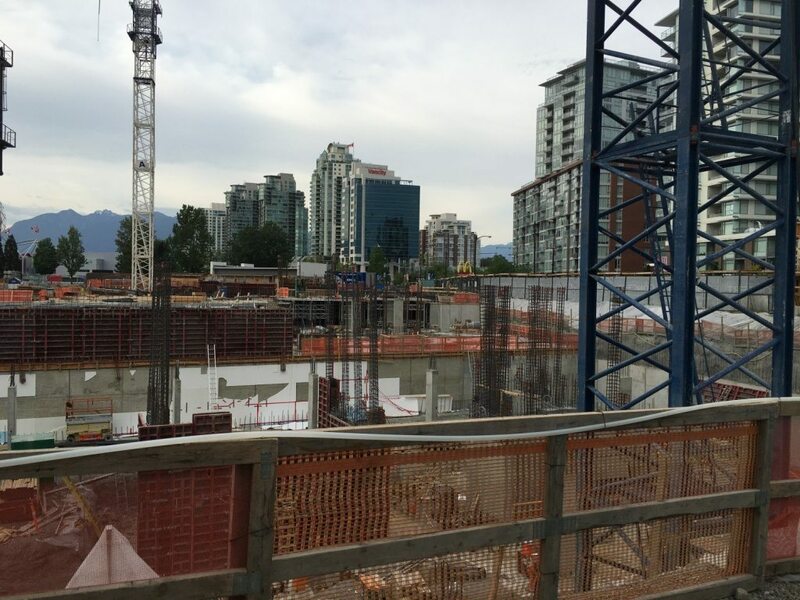 Construction on the first building, a non-market affordable rental apartment building owned by the City of Vancouver, is already underway. 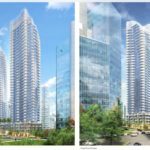 The 15-storey building will also have two childcare centres in its podium. At the same time, crews are working on the underground parking lot for Voda, the first phase of The Creek by Concert. 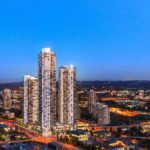 Here’s what to expect with Navío: A total of 177 units, with 110 of those units being two bedrooms or larger. There will also be townhouses up to three bedrooms. NAVÍO also includes a rare offering of 18 distinct townhomes featuring impressive entrances with two-storey stone façades and gated front patios. Follow the seawall home to your front door and enjoy more breathing room both inside and out. 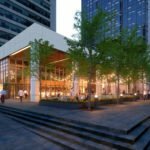 Phase one of the development, Voda at The Creek, sold out quickly after launch last year, with many buyers waiting in line outside for days. Rendering of Navio at the Creek, by Concert Properties. 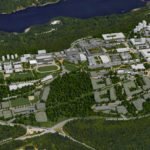 Rendering of the completed The Creek neighbourhood showing Voda at the left, and Navio highlighted on the right, along the new planned park stretching from Science World to East 1st Ave.